W. J. McKnight makes the point below that people who are guilty of the sin of singing uninspired hymns in worship should not be allowed to the Lord’s Table. This is certainly a controversial opinion, any thoughts? Furthermore, as Christ Jesus is no respecter of persons, we ought not to be, either; for, to be a Christian, if it means anything, means to be like Christ. This, that passage from James, already quoted, settles in so many words. And this our Church has always recognized. When one of our own members violates this commandment in the way referred to, he lays himself open to discipline. A faithful Session will prohibit him from coming to the Lord’s table until he has confessed his sin, given evidence of repentance, and promised not to be guilty of it again. If, then. the Church prevents its own members from communing if they commit this sin, why should it not prevent outsiders from communing when they commit the same sin? Why should the Session practice “respect of persons”? It is the violation of the law of God that is in question, and surely it is as bad for one man to transgress a divine command as it is for another. Believing this we apply “the law of the house”, as Ezekiel calls it, to prospective communicants, no matter who they may be. In reality we go below the question of the Church to which a person belongs to the question as to whether or not he is obeying the Ten Commandments. The same line of reasoning lies at the basis of our position on Psalmody, and on Instrumental Music in divine worship, and on Secret Societies. And here again we are at one, fundamentally, with the whole Presbyterian body. We all accept the Westminster Standards. 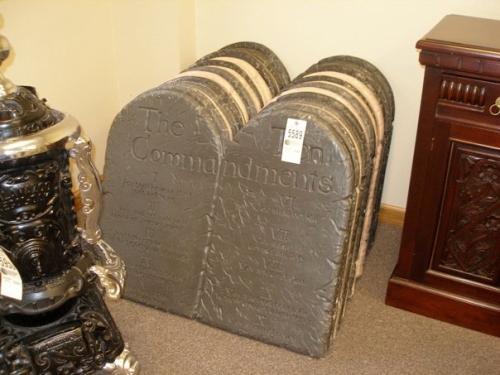 These declare that the Second Commandment forbids “all devising, counselling, commanding, using, and any wise approving, any religious worship not instituted by God Himself”, and anything and everything that would tend toward the corrupting of “the worship of God, adding to it, or taking from it”, whether such devices are “invented and taken up of ourselves, or received by tradition from others, though under the title of antiquity, custom, devotion, good intent, or any other pretense whatsoever”. As for the Third Commandment, they declare that it forbids “the not using God’s name as is required; and the abuse of it in an ignorant, vain, irreverent, profane, superstitious, or wicked mentioning or otherwise using His titles, attributes, ordinances, or works”. It would be difficult to make language stronger or more explicit. Now our Church holds that this interpretation of those Commandments binds the people of God to the exclusive use of the Psalms in divine worship, and puts them under solemn obligation to sing praises, as in apostolical times, without the use of musical instruments, and requires them to renounce the system of secretism as a system of darkness altogether unworthy of such as are called of God to be “the light of the world”. Thus it is our interpretation of the first three Commandments—reinforced, of course, from the rest of the Bible—that gives us our distinctive position as a Church. If our interpretation is not right, we ought to disband. If it is right, our Sessions ought to see that it is honored in every particular by every person who proposes to come to the Lord’s table under their jurisdiction. The “whole limit” is to be “most holy”. To the officers has been committed the charge, by the Lord Jesus Himself, of keeping it so. If they are faithful, they will do it—and that, too, as the Word of God requires, “without respect of persons” This is one place where sentiment has no right to intrude; obedience to orders is what the occasion demands, and the demand is absolute. All denominations have to reckon with the Ten Commandments. All alike have to assume some attitude toward the Moral Law. Some treat the matter very loosely and unsatisfactorily; some are more rigid, some are less. We, in common with all others are under the necessity of taking a stand. We have done it. We have interpreted the Law, and what constitutes its violation, to the very best of our ability. We have published our findings. The world knows our position. We pledge ourselves to be true to those findings and to that position every time we go to the communion table. We aim to be strictly impartial. We are no firmer with outsiders than we are with our own members. “Here is the law of the house”, we say; “Christ requires us to see that the law is observed; we have no option but to obey orders”. What our findings are—I mean those findings which keep us distinct from other Churches—may be fairly, yet succinctly, set forth in four brief statements. We hold, whether rightly or wrongly,—yet as a matter of fact we do hold,—that to support an unchristian Constitution in its unchristian condition is a sin, and such a sin as, unrepented of, should prevent a person from sitting down at the Lord’s table, either in our Church or in any other. We hold, whether rightly or wrongly, that to undertake to praise God with songs other than those which the Holy Spirit has inspired for that purpose is a sin, and such a sin as, unrepented of, should prevent a person from sitting down at the Lord’s table, either in our Church or in any other. We hold, whether rightly or wrongly, that to introduce instrumental music into the New Testament worship, when the Apostles organized that worship without it, is a sin, and such a sin as, unrepented of, should prevent a person from sitting down at the Lord’s table, either in our Church or in any other. We hold, whether rightly or wrongly, that union with secret societies is a sin, and such a sin as, unrepented of, should prevent a person from sitting down at the Lord’s table, either in our Church or in any other. The fact is that we find ourselves under obligation, in these respects, to bear a faithful testimony not only to the world, but to such other Churches also as differ with us on these intrinsically important questions. At the communion table our testimony comes to its climax. Shall we weaken where we should be firmest? Shall we waver where we should be immoveable? Shall we make it apparent on the Holy Mount that we are sincere in our conclusions and mean to maintain them to the end, or shall we choose the Holy Mount to make it apparent to other Churches and to the world, that we only half believe what we profess? Here, of all places, it would seem, we ought to aim to be perfect, even as our Father which is in heaven is perfect (Matt. 5:48). Evidently this is not the place to defend our position as a Church, as it comes to light in our distinctive principles. All we needed to do here was to state the principles fully enough to bring the situation clearly into mind. And this, we assume, has been done. From CONCERNING CLOSE COMMUNION. AN INVESTIGATION. by W.J. MCKNIGHT, D.D., Pastor of the First Reformed Presbyterian Church of Boston found here Concerning Close Communion by WJ Mcnight. Question #11: Is it a sin to sing uninspired hymns in worship?